Part 3 in a 10 part series on war in art. The Battle of Nagashino is one of the seminal battles in Japanese history. It took place on June 28, 1575 near Nagashino Castle and was one of the key engagements toward to conclusion of the Sengoku period.. The battle was fought as the forces of Takeda Katsuyori besieged the castle. Oda Nobunaga and Tokugawa Ieyasu sent relief forces. The two sides squared off in what is considered the first ‘modern’ battle in Japanese history. The Takeda clan had introduced the cavalry charge in recent times, to devastating effect. To counter this, Oda implemented a revolutionary use of firearms, volley fire, never before seen in Japan. As wave after wave of Takeda’s mounted troops rushed Oda’s position, they were mowed down by the revolving fire of the matchlock rifle-toting, samurai-led riflemen. The battle resulted in a clear defeat for the Takeda clan. Takeda Katsuyori lost 8 of his leading generals during the defeat. The weakened clan would go on to suffer a final defeat, a few years later, at the hands of the same two foes. Katsuyori committed suicide following this last defeat and the clan faded to obscurity. Oda, who had been a clear favorite to seize power, was betrayed and murdered by his own underling. His demise eventually paved the way for Tokugawa to defeat the other daimyo (warlords) and go on to become the shogun of Japan. 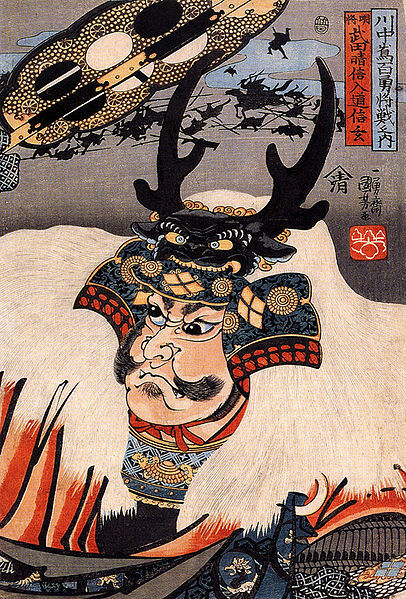 Takeda Shingen wearing his characteristic horned and crested helmet. By Utagawa Kuniyoshi, 1843 – 47. Usually I would include an artist image, but what we have to demonstrate the battle is a byōbu, a paneled screen. The painter of the screen is unknown (courtesy of willamette.edu). Many byōbu depict landscapes, but some show images of daily life and even battles. This particular byōbu isn’t the only one of the Battle of Nagashino, but I liked the color and the clear depiction of the arquebusier, or riflemen, and their position behind the stockades. There were any number of battles on other byōbus, but I’m intrigued by this one. I remember being awestruck to find out that samurais were also riflemen after the introduction of European firearms by the Portuguese. Oda used them to such devastating effect at Nagashino, but over time, their use waned to a near halt. Oh, and in lieu of an artist image, I’ve put up this painting of Takeda Shingen, father of the losing warlord in this battle. Why? Because the image is amazing! You can pretend he painted it if you like. This entry was posted in Age of Discovery, Art, Asia, Japan, War, War Paint Series and tagged Akiro Kurosawa, Arquebus, Arquebusier, Byōbu, History, Japanese Warfare, Kagemusha, Oda Nobunaga, Samurai, Sengoku, Shogun, Shogunate, Takeda, Tokugawa, Volley Fire, Warring States.